Home Beers Calicraft Brewing Co.
My first Calicraft beer - I really wanted to love this since I live pretty close to the brewery. Alas, it's just a middle-of-the-road, basic brown ale. I'm not a fan of the oak used, it's more or a wet wood aroma and not some deep, profound oaky presence. Everything else was ok. Poured a clear brown with a frothy 2 finger tan head that dissipated to a thin layer. Moderate lacing. Chocolate malt aroma with a bit of char and vanilla. Initial taste of sweet malt, chocolate and bit of coffee that is overwhelming followed by moderate woodiness and hop bitterness. Moderate body and carbonation and a bit of creaminess. This seems too bitter for a brown ale. Decanted from a 12 oz (355 ml) bottle into a conical pint; best by 10/17/18. A: Pours a clear brown with a one inch, fluffy, tan head, good retention and solid lacing. S: Aromas of mocha, macademia/almond, and vanilla are evident. Definitely malty to the nose. T: Sweet and malty. Flavors of coffee, lactose sugar, and vanilla with a little zestiness, consistent with but not exactly minty. Nutty flavors in the background. Bitterness plays a big role in tamping down the sweetness. M: Medium bodied with moderate carbonation. Sweet, tingly aftertaste/afterfeel. O: Definitely an interesting, flavor forward brown ale. A bit sweet for my taste, but I truly appreciate the enhanced flavors provided by the oaking. Would have like to have seen more bitterness offsetting some of the sweetness, but I supposed that would have basically made it a porter. A: The beer is brown in appearance and when held up to a bright light it is clear dark brownish red in color with a light to moderate amount of visible carbonation. It poured with a quarter finger high light tan colored head that died down, eventually leaving a thin layer of bubbles covering the surface, a narrow collar around the edge of the glass, and sone specks of bubbles clinging to the edge. S: Light to moderate aromas of nutty and chocolate malts are present in the nose along with hints of oak. T: The taste starts off with some initial flavors of chocolate and nutty malts but these are quickly replaced by strong flavors of oak along with hints of floral hops and a light amount of associated bitterness. M: It feels medium-bodied on the palate and has a moderate amount of carbonation. The hops lend some dryness to the finish. O: The oak aging completely changes the taste and mouthfeel of this brown ale, making it very unique. Dark chocolate brown color with fast fading light head, coffee and whisky oak barrel woodiness w notes of coffee, toffee, chocolate and whiskey. Sharp hop and deep roasty favor - drinks more like a stout than a brown. Good stuff! Pours a clear, dark, mahogany color. Smell is a mix of cocoa and a bit of coffee. Taste follows the nose, cocoa with a bit of coffee. Cross between a brown and a porter. The beer pours a very clear, lovely mahoghany with a thin cap of biege bubble that rapidly subside. Still, it looks nice in the glass with ample red tint. Aroma of malts, some nut aroma, toffee or caramel. Typical brown, but very subdued, muted. The flavor follows. It has the basic brown ale flavors, just not enough strength. There us also a metallic tang that gets in the way. Feel is thin, astringent, and there is a big smack of bitter mid-taste. Overall it is a drinkable, serviceable beer. Not something to seek out, but a decent middle of the road beer. 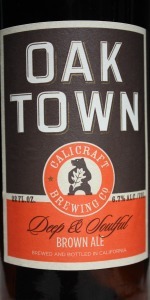 Oaktown Brown Ale from Calicraft Brewing Co.